enter your personal information and complete a purchase. In case, you selected a free version, you will immediately get an installation link. If you decided to buy multiple licenses for your team and want to get a discount, use the Get Quote button. In the opened window enter your message and email. Our managers will contact you as soon as possible and discuss possible variants that satisfy your needs in the best way. NB: The option Get Quote is available only for Enterprise licenses. After selecting a pricing plan you will be redirected to the purchase page. Check the details of the product that you are buying. Select a number of licenses (for Enterprise subscription). Select a subscription period: a month or a year. Choose, if you want to automatically renew the subscription. If you have a discount promo code, you can enter it in the corresponding field. On the next page, enter your credit card information and billing address. When it's done, click the Continue button. The last step is to check everything and to click the Buy button. If you need to correct some information, click the Change link. If you buy a professional license, you will get an installation link, and the license is attached to your name. 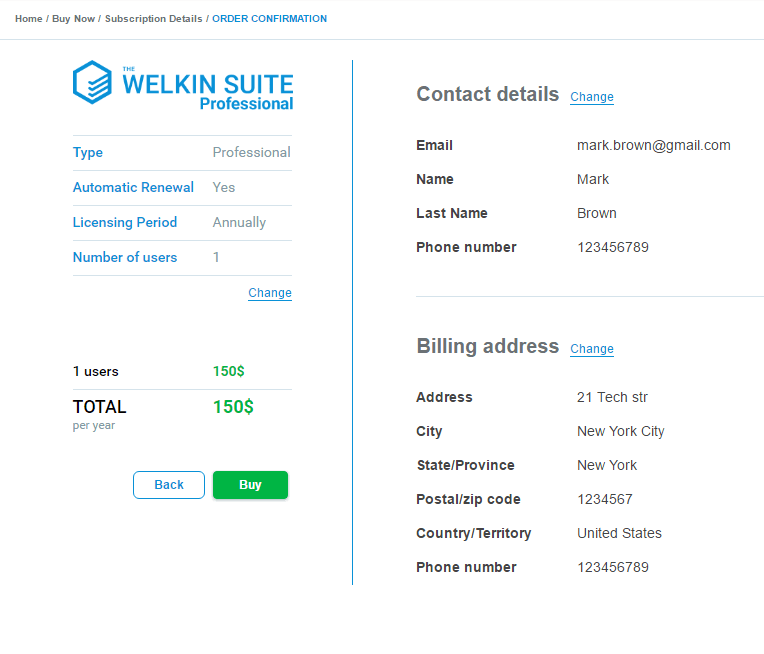 If you buy an enterprise license, you will get an ability to assign a specific email of your team member to each license using the options of Enterprise License Management. You have the ability to change a credit card that you have used for the purchasing. To do so, navigate to your profile: My Products ⇒ Billing Details and click the Change Card button. On the next page, you need to specify your credit card details.